Tom Cruise is not known for many movie lines but arguably his most well-known is “Show me the money”. When it comes to the Park brothers, money is often in, under, and around their activities. Getting details about the Parks and their financial transactions is often a difficult knot to unravel. It is however a fruitful area of research. They have been involved in many political operations and activities that don’t often see the light of day. In fact, illumination causes their operations to run for cover in much the same way as cockroaches do when the light is turned on. 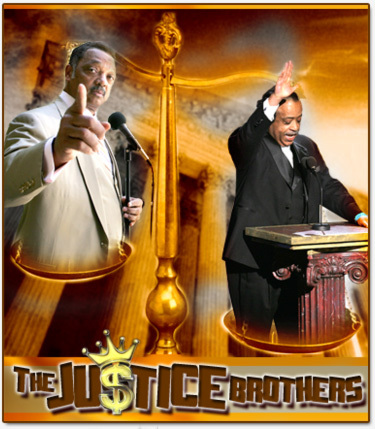 The more I learn about their dealings, the more comparisons I make between them and another famous political pair; namely, the Justice Brothers—Al Sharpton and Jesse Jackson. Yes, George and Aaron conduct shakedowns, run political black bag operations, and even have expense accounts paid by others. You will seldom find their names on campaign finance reports because they often use other consultants as conduits for the cash but every election cycle they come up with new and ingenious ways to get their cut. Sometime politicians get favorable blog coverage or unfavorable depending on whether they pay for protection. Sometimes Aaron will manage your campaign for you but be warned, he sometimes forgets to pull the pin before he tosses the grenade. Aaron sent this mailer to registered voters in the district on behalf of his candidate, Clint Parish. His opponent in the race was a sitting Superior Court Judge, Dan Maguire. Here are portions of an article about Maguire’s reaction to the mailer. Now the race for the judgeship, which generally eschews such personal attacks as unbefitting of the judiciary, has taken a turn into the kind of nasty and divisive politics that typically befalls other political races. “It’s deplorable when any candidate resorts to such tactics, and unthinkable to imagine that a person comfortable spewing such lies could be a judge,” Judge Maguire added. “I never took such trips,” Judge Maguire added. What is it with the Parks? Ever notice that they always accuse their enemies of fraud? At this point, Deputy DA Clint Parish has not responded to the Vanguard’s request for substantiation. The flyer was a hit piece in the worst way. Nothing was true except that the judge was appointed near the end of Arnold’s term as Governor. The flyer was paid for by Clint Parish for Judge, Aaron’s client. 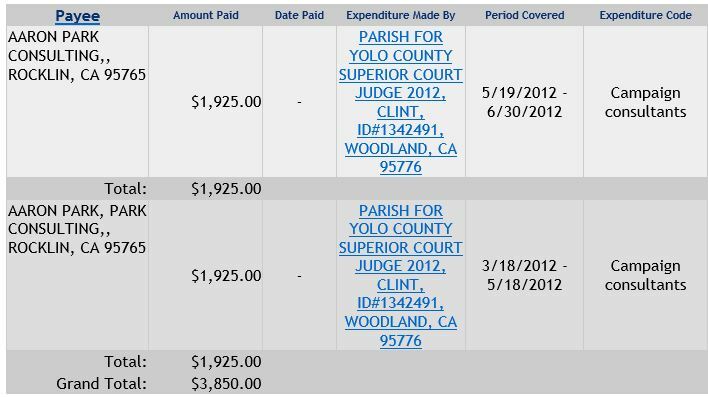 Yolo Superior Court judicial candidate and deputy district attorney Clint Parish on Thursday identified the political consultant who created the attack mailer targeting a rival candidate, Superior Court Judge Dan Maguire. Parish also expressed regret for sending out the mail piece. Parish fired Park Consulting, the firm led by Placer County political operative and blogger Aaron F. Park,for the mailer that sought to tie Maguire to corporate fraud and bribery of Russian firms while working for a Colorado law practice. Please note the use of the plural in this quote. “I don’t have any information that he (Maquire) worked on that case. I trusted their opinion, and I definitely shouldn’t have,” Parish said of his former consultants. Park’s mailer had far reaching consequences. 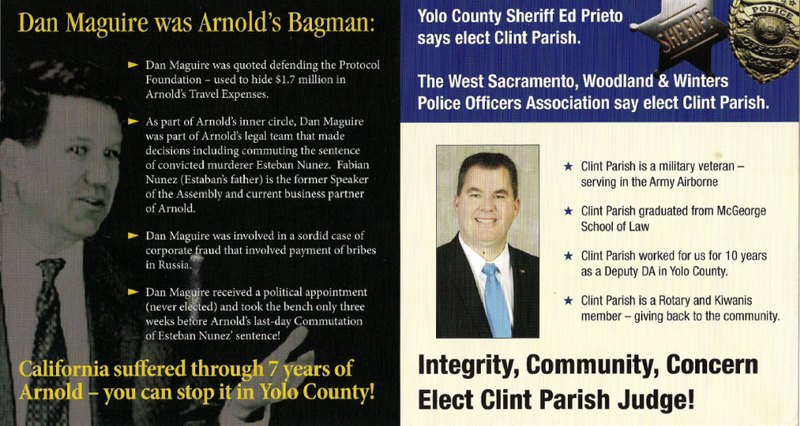 As a result of public backlash regarding the mailer, Parish lost some endorsements, including his boss, Yolo County District Attorney Jeff Reisig, and Yolo County Sheriff Ed Prieto. He also lost the endorsement of the Yolo County Republican Central Committee. Parish’s boss, District Attorney Jeff Reisig, and the Woodland Professional Police Employees’ Association both withdrew their support for Parish’s candidacy, two days after Yolo County Sheriff Ed Prieto said he was no longer backing the prosecutor’s bid to unseat incumbent Judge Dan Maguire. Aaron Park’s mailer cost more than just an election for the Deputy District Attorney; Park’s actions caused his client to lose his job as a Deputy District Attorney and face disciplinary action from the State Bar. The State Bar Court has issued a public reproval of a lawyer who falsely accused his opponent in a June 2012 judicial campaign of being involved in a bribery and corporate fraud scheme. The order disciplining Clinton Edward Parish, 43, is scheduled to go into effect Feb. 26, and requires him to complete State Bar Ethics School within one year and pass the test given at the end of that session. The order may be appealed to the California Supreme Court. Parish had been a Yolo County deputy district attorney when he ran against Judge Dan Maguire in the 2012 judicial election. Not long after his landslide loss, he left Yolo County and starting working in Tuolomne County. According to the State Bar, he is working at his own law office in Sonora. Parish tried to link his opponent, Maguire, with misleading campaign mailers by tying him to alleged corruption under former Gov. 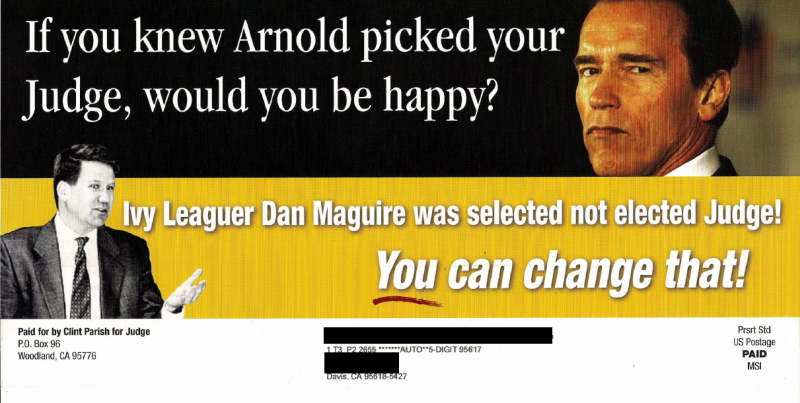 Arnold Schwarzenegger, for whom Maguire worked as a legal aide before being appointed to the Yolo bench in 2010. He also alleged connections between Maguire and Schwarzenegger’s January 2011 commutation of a prison sentence for Esteban Nunez, son of former Assembly Speaker Fabian Nunez. In addition, Parish claimed Maguire was involved in corporate bribery while at a Colorado law firm in the 1990s. Maguire said the claims were false, and Parish later acknowledged he did not thoroughly check out the accusations. Parish said the mailers were produced by Park Consulting, a Rocklin-based company run by conservative political activist Aaron Park. Parish ultimately terminated his relationship with the company. Oh, per the Secretary of State, Aaron was paid $3,850 for this opportunity to flex his superior political muscle. Meanwhile Aaron is still at his day job in Placer County trying to do to CRA what he did for his client.